Beware! Do not buy your tickets before travelling to our Le Mans chateaux.....previous guests have arrived at our mesmerising chateaux and have not left to see any racing! We have been working with a range of chateaux for many years in the Le Mans area and we can thoroughly recommend the venues, service and welcome without hesitation. A chateau stay is a superb chance to gather guests or friends for a unique house party and perhaps enjoy sensational racing at Le Mans. The Chateau des Arches is one of the closest chateau to the circuit. 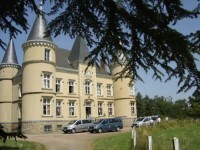 The chateau is located in Yvre-l'Eveque, just over 4 miles from Le Mans. 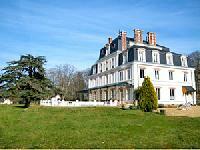 The restored chateau dates from the 18th century and is surrounded by a large wooded park. The chateau offers authentic 5 guest rooms and all rooms have private bathrooms; they are bright and spacious and combine a modern touch with stylish decoration and antique furniture. A sumptuous breakfast is included. 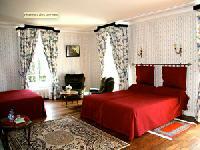 The chateau is not a full service hotel, rather a chambre d'hote and the attention from the owners is second to none. Chateau de la Motte Henry is a spectacular neo-Renaissance Castle with beautiful outbuildings nestled in the Western Loire Valley, a region known for its beauty, tranquility and cuisine. The property is an ancient motte surrounded by a moat within 29 acres of parkland, paths and fields with exotic trees such a cedars of Lebanon & American redwood. There is also a private lake for swimming or boating. 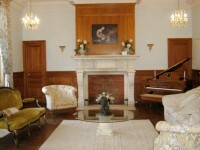 The Chateau has 12 superb guest rooms which have all been recently refurbished. Each room is decorated in authentic period decor with ensuite, marble bathrooms. One room does not have ensuite facilities. The majority of the guest rooms are also extraordinarily spacious - some of the largest rooms we have seen. The grid price includes exclusive use of the chateau, 12 guest rooms, the Orangerie and Swimming Pool. The price is based on 20 guests travelling in 5 cars. Within the grounds is a Pavilion overlooking the lake, offering three smaller but charming guest rooms. The Pavilion offers a swimming pool within a magnificent walled rose garden. The swimming pool is surrounded by Italian baroque fountains and flower gardens. Guests residing in the Pavilion also have use of the Orangery, a vast and dramatic pool and games house with indoor barbeque overlooking the pool and walled gardens. It also has a television, bathroom with jacuzzi and hydro-massage Tub. The Chateau is located approximately 40 miles west of Le Mans. Transfers are available by both mini-van or coach or by helicopter. The local town of Meslay-du-Maine also has an excellent 'Course Hippique' with both traditional and chariot racing and there is also a good golf course nearby. The Times, May 2016: "Follow the chestnut tree-lined drive to this turreted 19th century castle in the western Loire and you will fall under its spell. Set in 29 acres of parkland complete with orchards, a walled rose garden and a spring fed lake, it also offers a pretty outside pool. Inside, there is a wood panelled music room with baby grand piano and marble fireplace, a circular litchen in the tower and for further escapism, a not so historic cinema room. The six enormous bedrooms feature dreamy four poster beds as part of the sumptuous furnishings." Since May 2016, the chateau has been comprehensively refurbished by new owners providing an exclusive and sophisticated stay for the 24 Hours. L'Oseraie is a private chateau sitting gracefully in its own 23 hectares of varied parkland, woods and fields, bordered to one side by the river Sarthe and the village of Chemire sur Sarthe on another. The chateau is located to the west of La Fleche and is approximately a 50 minute car drive to Le Mans - the route will also take you into Arnage which provides a quicker access to the circuit. The Chateau has been tastefully and sympathetically refurbished in 2012/3 to provide high quality comfort and amenity for our guests whilst retaining as much as possible of the authentic character and gracious elegance of the Chateau. Guests are warmly and personally welcomed. The owners are on hand throughout guests' visits to help and encourage you to make the most of your stay, whether through advice on exploring the surroundings, recommending retaurants to suit your personal tastes and preference or booking activities for your group. All bedrooms have comfortable high quality beds made up with pure cotton high thread count bedding, and fluffy white towels in the bathrooms. The Chateau is not a hotel ? so do please bear this in mind if you are looking for and prefer a formal hotel experience with full hotel services. For groups, we can offer Bell 206 helicopters which have 4 seats each for the transfer from the chateaux to Le Mans. The journey time is approximately 15 minutes. Transfers can also be made be executive mini-vans or coach or a mixture of road and air. For a return helicopter flight, the latest departure time will be 21:30. For corporate guests or private groups, there are a number of ways to travel to our chateaux. We can organise a private flight charter into Tours or Le Mans, a scheduled air service into Tours or first class rail travel directly into Tours or Le Mans. Please contact reservations should you require a detailed quote for a private charter.